Gov. 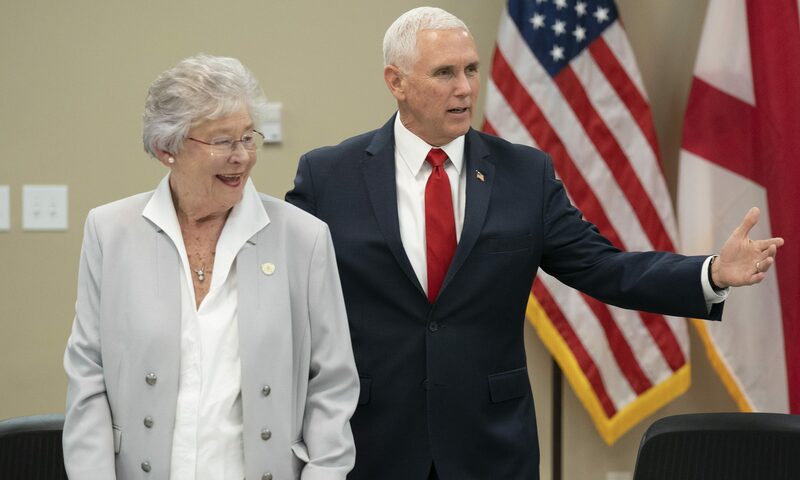 Kay Ivey made us very proud by welcoming Vice President Mike Pence and the National Space Council to the Marshall Space Flight Center in Huntsville this week. I watched the three -hour event through live streaming. It was awesome. I was happy to see our Secretary of the Air Force Heather Wilson on the Council and sitting next to the Vice President. Alabama is a leader in information technology, automobile manufacturing, aerospace, and space exploration industries; with entities like the Marshall Space Flight Center in Huntsville, Airbus in Mobile, Blue Origin in Huntsville, United Launch Alliance In Decatur, Hyundai in Montgomery, Mercedes in Vance, and Toyota in Huntsville. Ivey, a visionary, as the state’s chief executive and president of the state school board, and her staff have been taking a look at some of the advanced courses, that are highly recommended to gain employment in the aforementioned fields, such as astrophysics, calculus, astronomy, chemistry, biology, physical science, statistics, trigonometry, computer science, geometry, algebra, electrical and mechanical engineering. Since becoming governor, Ivey has been tirelessly working to create a new education business model, that will tie and match the needs of business and industry, to the curriculum and courses offered at the K-12, university and college levels. Alabama has one of the best in the nation and top-notch, education systems for pre-kindergarten through 4th grade. Upon Ivey’s taking office, after the resignation of former Gov. Robert Bentley, numerous letters were sent to persons in Washington, D.C. including the Secretary of Education Betsy Devos. The correspondence explained the new sense of excitement and energy being exuded by Ivey, to improve education and move the system further along in the right direction. Last year Gov. Ivey and Lt. Gen. Anthony Cotton, commander and president of Air University at Maxwell-Gunter established a committee to improve education in the Montgomery area. Cotton has signed a proclamation to continue this collaborative effort for years to come. The general has been featured in the worldwide Air Force Times news magazine. Cotton has hosted numerous Education Summits at Maxwell-Gunter. Participants have included top State Department of Education leaders, area school superintendents, universities, area and regional base military base officials, Maxwell-Gunter School administrators, active duty military, spouses, and the Alabama National Guard. The Maxwell-Gunter Elementary and Middle School has a top-notch school system. I used to teach at the school. According to their STARBASE Maxwell website, they also serve students that are historically under- represented in the Science, Technology, Engineering and Math (STEM) fields, and they also encourage students to set career goals and achieve them. The Department of Defense Education Activity System’s STARBASE program is on-site at Maxwell-Gunter Air Force Base. It is a unique STEM lab where 5th graders from Montgomery, Autauga, and Elmore counties have unique hands-on experience throughout each school year. While at STARBASE, students build and program robots, launch rockets and study with professional lab equipment. STARBASE Maxwell-Gunter is a premier educational program which focuses on elementary school students primarily those in the fifth grade. The program’s ultimate goal is to motivate students to explore Science, Technology, Engineering and Math (STEM) as they continue their education. As a former information technology teacher, I truly believe that Gov. Ivey and Lt. Gen. Cotton are on track and headed in the right direction. Students must have a strong background in STEM for reasons that are four-fold. First, the STEM courses will help improve ACT test scores for students who are planning to enter colleges and universities. They will be college ready. Secondly, the courses will preclude students having to take remedial courses when they arrive at colleges and universities. Thirdly, students will be able to successfully pass business and industry certifications, which are very difficult to earn, and they will enter the workforce being career- ready. Next, students will be able to apply their knowledge in high school and possibly earn university and college scholarships. Another area of concern is that many Alabama high school students who are enrolled in robotics courses are earning A’s, and the same students enrolled in engineering are scoring F’s, due to poor math skills. Further, the business and industry certifications being offered within our high schools must be upgraded. For instance, many students are earning basic certifications such as Microsoft word, power point, excel, access and publisher. Higher level certifications are needed. Some of the required certifications that business and industry are requesting include, information technology networking and troubleshooting, cyber-security, welding, programming, electricians, nursing, computer science, automotive mechanics, plumbers, heating, ventilation and air conditioning and construction. Congratulations to Mr. Paul Hernandez at Maxwell-Gunter, for being named as the 2019 Department of Defense Education Activity (DODEA) America’s Principal of the Year. “Paul leads as a data-driven principal who motivates others to make a difference in the lives of students and staff,” said Dr. Judith Minor DODEA Americas Region Director of Student Excellence. The Maxwell-Gunter Elementary and Middle School, faculty, staff, parents, PTA, students and the base leadership, are making us very proud of them.